Ú Fortalecer la Federacion Purhepecha con idioma, danzas, cancion, y cultura en CA. Como? Ú Unir a nuestra gente Purhepecha de Michoacan, Guanajuato, Queretaro, Colima etc. en CA. Ú Educar a nuestra comunidad sobre nuestra cultura indigena de la Nacion Purhepecha Zapatista. Ú Reintreducir medicinas indigenas Purhepecha – Xikuamecha: remedios naturales, etc. Ú Trabajor con otras confederaciones de Anahuac o pueblos de las Americas y nuestras tierras. Ú Expandir nuestro collectivo para otras comunidades. Ú Oportunidades: Sabemos que nuestra gente Purhepecha existe: Somos directamente descendientes del pueblo Purhepecha y reclamamos nuestra identidad indigena con todos los derechos y todas las responsabilidades de ser una nacion indigena. Ú Problemas: Aunque gobiernos coloniales no nos reconozcan, nosotros nos reconosemos y trabajaremos con otras naciones indigenas. Ú Riesgos - Nuestra cultura se esta desapareciendo o no esta presente. Ú Peticion - Establizar una Confederacion Purhepecha en Alta California. Ú Regalos - Conoser nuestra identidad, unir a nuestra gente, y aseguraar el futuro de los ninios. Ú Conclusion: No nos dilataremos - Nuestro future depende en cada uno de nosotros. Ú Termino Corto-Estudiar/aprender/enseniar la idioma a nuestras comunidades. Establezer una confederacion en CA. Termino Largo-Tener nuestras propias escuelas y clases en Purhepecha. Si prolongamos estas decisiones, las consecuencias seran grabes para nuestros ninios y el futuro del nuestra gente. En fin, nuestra meta sera de ser una nacion soberana. Cueste lo que cueste, siempre seremos Purhepecha. The name of the organization is Orgullo Purhepecha. The headquarters of Orgullo Purhepecha is located in the state of Washington as required for our incorporation as a 501(c)3 Not for Profit Corporation in California, for the future gifting by the State of California, and for the establishment of our cultural center at Los Angeles, California. *The Free Exercise Clause of The 1968 Indian Civil Rights Act. Orgullo Purhepecha will be referred to in the By-Laws as our organization. Our organization is organized to prepare, apply, manage, and appraise projects to carry out the objective and purpose of our organization to assist in the congregation of the Purhepecha Indians and to encourage and relearn the heritage of our society for the betterment of the community, the state, and the nation in improving the quality of life, promote traditions, and preserve the culture of the Purhepecha Indian Nation. In carrying out its purpose, our organization will accept voluntary contributions, obtain city, county, state and federal government grants, awards or other funding such as public funding, private funding and grants, awards or other funding from private or public charitable organizations and foundations. The membership of our organization shall be open to all persons of Purhepecha ancestry. In order to not continue the divisions amongst descendants of indigenous people, who are oftentimes labeled discriminately and viewed as inhumane; the Purhepecha however, humanize indigenous people as any other race in the Americas. Furthermore, our organization accepts the truthfulness and authenticity of the Purhepecha descendants. All members shall abide by our organization resolutions and Bylaws of our organization. Active Members are distinct as those that have contributed to our organization of Orgullo Purhepecha, participate in committees, continue in their involvement of the Purhepecha Council, and are over the age of eighteen (18) years old. These members are qualified to hold council and to vote in all council elections of our organization. Once donations are given or community service is conducted, then commitment will be assessed yearly to support our organization. Active Members-Minors are defined as those that have contributed to our organization of Orgullo Purhepecha, are current on their community work, and are under the age of eighteen (18) years old. These members are not eligible to hold council or to vote in all council elections of our organization. Once community service is dedicated, then evaluations will be assessed yearly as members who support our organization. Recognized Members are defined as those that have not contributed physically to Orgullo Purhepecha but, do not participate in committees, nor are involved in the Purhepecha Council, and are over the age of eighteen (18) years old. These members are not qualified to hold council nor vote in council elections of our organization. However, these members do keep in contact and help in other ways such as in recruitment or promotion to support our organization. A Recognized member must contribute physically, participate in committees, and become involved in Orgullo Purhepecha to become an Active Member. Proof of Purhepecha ancestry will not be required by the Purhepecha Council prior to recognition. However, members will be asked and encouraged to find out more about their lineage and learn to speak Purhepecha, which is a vibrant living language. Purhepecha are defined culturally and not so much physically. Non- Purhepecha are eligible for affiliate membership in the organization. Affiliate members, eighteen (18) years of age or older, have all of the privileges of active members, except they cannot vote nor can they be part of the Purhepecha Council. 4.4. PARTNERS OF ACTIVE MEMBERS. Partners of active members are without question accepted as active members of our organization should they choose to be recognized. Prior to becoming a member of Orgullo Purhepecha, a potential member shall commit to the Purhepecha Council in meetings, committees, and gatherings with perseverance, thus upholding the name of Orgullo Purhepecha, which translates to Purhepecha Pride. No applications shall be needed, but shall be orally and physically documented for approval by the Purhepecha Council. The Purhepecha Council will then review the applicant and the declaration of fact and finally, issue Purhepecha membership. In the event there is no local family, candidates will have to establish a local chapter. A Community Leader will then be appointed by the Purhepecha Council. 4.6. APPROVAL OF NEW MEMBERS. The Purhepecha Council shall evaluate and assess all applicants for membership in our organization Orgullo Purhepecha. The Purhepecha Council will document new applicants, besides supplementary revisions of personal information, and approve membership. 4.7. MEMBERSHIP OBSERVANCE OF RULES. All members shall observe and abide by the rules and regulations of Orgullo Purhepecha, its bylaws, and its articles of our organization. The members of the Purhepecha Council may designate a person as an honorary member based upon their contributions, either by commitment or by service to the organization. Orgullo Purhepecha can evaluate and defer membership based upon being Dormant, or not being in contact with Purhepecha Council. A member of our organization Orgullo Purhepecha that has been considered dormant will be always welcomed to come back once their personal issues are resolved. Ambition to be a member of our organization will be ultimately determined by a person(s) diligent commitment. 4.10. NO EVIDENCE IS REQUIRED BUT GENEOLOGY IS REQUESTED. Persons accepted for membership in our organization will not be given an identification number. Unlike government policies, the Purhepecha strongly feel that a person is considered part of an organization depending on the heart of their dedication. Family lineages will be encouraged, however, Purhepecha understand that many indigenous person(s) have been displaced throughout history. No person who is a member in good repertoire of our organization Orgullo Purhepecha shall be an affiliate of any group or organization whose intention are incriminatory or in quarrel with our organization as considered by the Purhepecha Council. The defiance of this amendment is reason for membership removal by a vote of the Purhepecha Council. 4.12. REMOVAL OF A COMMUNITY LEADER. A Community Leader may be requested from our organization as a supplementary obligation, development, or to take his/her place in the common membership by the Principal Leader and the Purhepecha Council. An eligible Community Leader will then be called to continue that responsibility. All members who are Active Members as defined in these bylaws that are eighteen (18) years of age and above shall be deemed eligible to hold council in our organization. Any member or affiliate may make in person to the Purhepecha Council a grievance in opposition to any member of our organization on his/her understanding that such member is infringing the conditions of his/her membership or acting against the best interest of Orgullo Purhepecha and request that the Purhepecha Council inquire into the truth of such contention. The Purhepecha Council shall evaluate the grievance or claim to decide the genuineness and accurateness of such grievance and to agree on what, if any, decision the Purhepecha Council should take regarding such criticism. The Purhepecha Council shall have the final decision to either to discharge the grievance with/out progress or maintain. The member who is being scrutinized shall, during the evaluation, retain his/her membership in good repertoire with all constitutional rights and human rights until the Purhepecha Council votes otherwise. A person&#8217;s membership, active, affiliate, or honorary, may be deferred or banned by the Purhepecha Council on just grounds as a result of a oral complaint with factual evidence. Before the Fire, with a Talking Stick, and/or amongst the Purhepecha Council an oral grievance will be heard, with a suggestion. The Purhepecha Council will then advise a member that it recommends deferment or banned membership on valid grounds, and a person will be given the opportunity for an inquiry facing the Purhepecha Council. 5.4. GROUNDS FOR DEFERMENT OR BANNING. A persons membership may be deferred or banned for any malevolent deliberate action that infringes terms of membership with unscrupulously behavior to our organization. Once deferment or banned membership is final by the Purhepecha Council, the member shall no longer to be a member Orgullo Purhepecha for as long as the deferment or banning is applicable pending reinstatement. The period of deferment of membership shall be determined by the Purhepecha Council until it is in the best interest of our organization. Banning a member will lead to a longer deferment with a possibility of correcting any actions. However, a renounced member will no longer be part of Orgullo Purhepecha and will go before the Purhepecha Council if requested. The Purhepecha Council shall then submit to the members their recommendation for their final decision with elaborated opinions. Renounced member of a family belonging to our organization Orgullo Purhepecha shall not be deemed banned of membership from their own family. Until final deferment, banning, and renouncement is complete, members shall then denounce membership of Orgullo Purhepecha and return all records in possession belonging to the Purhepecha Council, as well as privileges shall finish once renounced. Orgullo Purhepecha may create member dues, assignments, and analysis of member commitments that shall be conducted by all members. Community service will be substituted with member dues. All donations and considerations shall be recognized by the Purhepecha Council and shall be appraised and acknowledged each year. Yearly dues for adult members shall be $10.00, for children under eighteen (18) years old $5.00. Dues for all members are due and payable by February 02 of the Purhepecha Calendar year. The first dues assessment is due February 02, 2009. All members are urged to pay yearly dues to vote in the Purhepecha Council. Orgullo Purhepecha may, on a good basis, waive payment of dues by a member who provides exceptional conditions. Members must speak to the Purhepecha Council and request a waiver of dues for each member and state motive why the waiver should be approved to the Purhepecha Council and why the member cannot be involved physically. Members granted waivers are restricted from voting/holding council until dues are paid. There is no application fee for a new application for membership, nor shall it be established by the Purhepecha Council. Membership packages and picture ID card shall be determined in the future and shall range from $10.00 for minors and $20.00 for adults. Community service shall be an opportunity to those who cannot commit financially. The fee for replacement picture ID membership card shall be established by the Purhepecha Council and shall not exceed the cost of $10.00. Dormant members of Orgullo Purhepecha that apply for active membership in the organization are not required to pay for lapse timeframes. The fee for continued or new membership cards for dormant members shall be established by the Purhepecha Council. Members of the Orgullo Purhepecha shall serve until no further work can be done, members decide to step down, or a more qualified candidate is set, which shall be heard by the Purhepecha Council. The Purhepecha Council shall make rules and regulations as is important for the purpose of set bylaws and to promote for the good of our organization to implement resolutions and actions whereas, necessities exist to preserve community empowerment. Set rules and regulations shall not be opposing to law, the articles of the organization, or these bylaws. A rule, policy, or regulation may be modified, amended or repealed by the Purhepecha Council in the unsurpassed focus for the members of our organization. 7.5. RESPONSIBILITIES OF ORGULLO PURHEPECHA. 5. Offer policy guidance to the expenditure of funds by the Orgullo Purhepecha. A Purhepecha Council Member may be removed from Council by an election of no-confidence by two-thirds (2/3) Members of the Purhepecha Council or by a calling, improvement, or to obtain his/her place upon the common association for the express rationale of that member. Special gathering shall be entitled as afforded for the intention of removing a Purhepecha Council Member of Orgullo Purhepecha and must have at least thirty (30) days written and oral notice prior to the date of meeting. If there is a inconsistency between a vote of the Purhepecha Council, the vote of the President will prevail unless the President is being removed. If a vacancy occurs (other than the President); the President shall give an opinion to the Purhepecha Council a person to fill the opening, upon the consent of the Purhepecha Council to fill the unexpired period. In the absence of the President to fulfill the duties of the Council, responsibilities shall be conducted by the Vice President. If the Vice President is not capable to serve, the Purhepecha Council at a called or regular schedule meeting shall designate by majority vote to perform the duties of the President for the unexpired term of office. The Vice- President shall assume the duties of the President upon the absence of the President and serve in other capacities as the President may decide. The Organization Treasurer shall keep an accurate and up-to-date roster of all members of this organization and shall at least once a year cause a copy of such roster to be printed and placed in the hands of all Chiefs of the organization pertaining to their Family. Furthermore, the Secretary shall keep an accurate record of all Families belonging to this organization. The Record Keeper shall keep an accurate account of Families, including names, addresses, contacts, states, or country they represent. He or she will be in charge for organizing of an annual meeting of all Families and keeping of all meeting records for the Organization Treasurer to report back to the Purhepecha Council of our organization. She or he shall council the Families when assistance is desired for leadership within a Family. 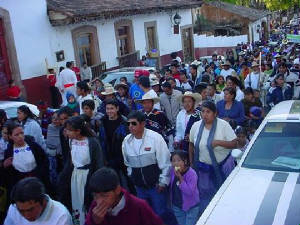 Orgullo Purhepecha, if authorized by the Purhepecha Council, may manage its business relationships in equipped division. Each division may have such staff, managers, and volunteers as may be needed to operate. Each division shall be subject to the Purhepecha Council and Members. Each division manager shall report to the President. The Purhepecha Council shall adopt rules, regulations, strategies, and measures crucial to oversee the procedures of each division. No member of this organization shall be entitled to any portion of the net earnings of the organization except as in form of grants or scholarships as provided in these laws. However, this organization may pay a member of this organization for expenses for services rendered to it. The organization may also employ members of the organization to perform specific tasks, as designated by the Purhepecha Council, paying them in funds designated for that purpose. All agreements shall be approved by the President and no loans shall be made by any Council Member or any loan safe on behalf of our organization devoid of the power of the President and no mortgage, title deed to secure debt, title deed note or other legal document whatsoever shall be implemented except upon the authority of the President. Land grants designated to our organization will be nominated on the legal document as owned by our organization. The title deed will be positioned in the hands of the President and rectified by the Purhepecha Council. Rules and restrictions may be sanctioned only by the Purhepecha Council. Funds raised by families, where the name or Tax ID of our organization is not exploited, may be reserved by the family assets. All family funds and gifts in kind must be reported to the Organization Treasurer or President by February 02 of each year, by a judgment of the internal revenue service of the U.S. government. All that have given contributions to Orgullo Purhepecha will receive a tax receipt by February 02 of the following year as set in the laws of the Internal Revenue Service. All investments put out by the Families or Members shall be counted as a contribution, unless elected by the Purhepecha Council to compensate the suitable person/family. The annual meeting of the members of the organization shall be held in various locations, on a day, and at a time designated by the Purhepecha Council. 11.2. NOTICE OF ANNUAL MEETING. A standard notice of an annual gathering shall be mailed to each members of record at their address as appeared by the records of our organization listing no less then two weeks prior to the meeting by the Organization Treasurer of our organization or by such other person designated by the Purhepecha Council. 11.3. STANDARD MEETING OF PURHEPECHA COUNCIL. Standard meetings shall be held monthly or as the Purhepecha Council deems required at such time and place as shall be elected by the Purhepecha Council and may be held in combination with the standard monthly gathering of the members. 11.4. SPECIAL ASSEMBLY OF THE PURHEPECHA COUNCIL OR MEMBERS. A special meeting of the Purhepecha Council or the membership may be held at the call of the President, Organization Treasurer, a majority of the Purhepecha Council, or upon the call by petition of any twelve members of our organization. Special assembly shall be held in a place, date, and time nominated in the call. A special assembly of the Purhepecha Council or the members shall require a ten (10) day written notice. This notice may be waived for emergency called meetings provided reasonable notice has been given, a quorum is present and those councilors or members present sign a waiver of the written notice requirement. The business to be transacted at all special meetings of the Purhepecha Council or the membership shall be confined to the matters set forth in the notice of the meeting. This restriction shall not apply if there are two-thirds (2/3) of the members present at the meeting. No member of our organization shall be permitted to remain at any gathering or at any function of our organization or otherwise be acceptable to take part in any way in any meeting or function while drinking any alcoholic beverage or under the influence of any drug or alcohol or while in possession of any drug or alcohol, unless such drugs are prescribed by a doctor. Likewise, no visitor shall be allowed to remain or partake as specified above while drinking or using, being under the influence of or in possession of any drug or alcohol, unless such drugs are prescribed by a doctor. All meetings of the Purhepecha Council shall be open to members. The Purhepecha Council may approve rational rules and regulations as necessary and appropriate to bring business of our organization, unless in disagreement with these bylaws all meetings of our organization shall coincide to these laws. Each individual who is or was made a party or threatened to be made a party or is otherwise involved in any threatened, pending or completed action, suit of proceeding, whether civil, criminal, administrative or investigative (hereinafter a proceeding), by reason of the fact he or she, or a person of whom he or she is a legal representative, is or was a member, shall be indemnified and held harmless by the, as the same exists or may hereafter be amended (but in the case of any such amendment, only to the extent that such amendment permits the organization to provide broader indemnification rights than the codes permitted the organization to provide prior to such amendment, against all expenses, liability and loss (including attorneys fees, judgments, fines, arias excise, taxes or penalties, and amounts paid or to be paid in settlement), actually and reasonably incurred or suffered by such member who has ceased to be a member and shall inure to the benefit of the members heirs, executors and administrators. Except with respect to proceedings to enforce rights to indemnification by a member, the organization shall indemnify any such member in connection with a proceeding (or part thereof) initiated by such member, only if such proceeding (or part thereof) was authorized by the Purhepecha Council of our organization. The right to indemnification conferred in this article shall be a contract right. These bylaws may be amended and supplementary bylaws may be adopted by a majority vote at any annual meeting of the Purhepecha Council, if in the observance of a special conference, the proposed revision of the new bylaws shall be set forth to the letter, or by a two-thirds (2/3) majority vote at any members assembly having a quorum where the notice of such revision or new bylaw(s) is not given: provided, however, that no change in the time or place for the election of the Purhepecha Council shall be made within thirty (30) days next before the day on which such election is to be held without the written consent of all the Purhepecha Council members. Ejercito Zapatista Liberation National- Nos Recordamos Atenco, Los Hombres Que Mataron, y Las Mujeres Que Violaron; Los Asesinatos en Michoacan y Oaxaca; y el Masacre de Acteal, Chiapas.